NSP has started receiving applications for Top Class Education For Students With Disability 2018-19. To apply-visit here!! Home Scholarship & Fellowship Top Class Education For Students With Disability 2018-19- Application Form Released -Apply!! Top Class Education For Students With Disability 2018-19- Application Form Released -Apply!! Top Class Education For Students With Disability 2018-19: Department of empowerment of persons with disabilities invites applications for scholarship to recognize and promote quality education among students with the disability and pursue post graduation courses. Application form for session 2018-19 has been released on 23rd July 2018. Visit the latest update section below to apply before 31st October 2018. 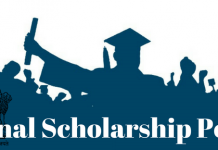 It is centrally funded government scholarship scheme. As per the latest released official notification, the Applications for the National Scholarship Portal under Central Schemes, State Schemes, UGC Schemes, AICTE Schemes has been released on 23rd July 2018. Eligible students can apply till 31st October 2018 in online mode. Link for new registration and renewal is provided in the application form section given below. Candidates applying for this scholarship scheme must possess the below-mentioned eligibility criteria. Students who fulfills the below criteria can apply for the Top Class Education For Students With Disability 2018-19. Only those candidates who have passed the Maharashtra or Higher Secondary or any higher examination of a recognized university or board of secondary education will be eligible. Courses at the level of post-graduate degree/diploma/ certificate are also covered under this scheme. Candidates who after passing one stage of education are studying in the same stage of educartion in different in different subject e.g B.Com, after B.A in other subject will not be eligible. However, students pursing LLB/B.Ed/B.El.Ed after passing B.A/B.Sc/B.E etc. are eligible for post-matric scholarship under this scheme. Students who are pursuing two different courses of study simultaneously can avail the scholarship fo any one course only provided pursuance of such courses are permissible under the rules/regulation of the educational authority concerned. Students studying in class 11 of the higher secondary scholl courses of the class 12 of the multipurpose high school will not be eligible for it being continuous school course. However, in case where 10th class examination of such courses is treated as equivalent to matriculation and students who after passing 10th class join other courses. Such students will be treated as post-matric students and will be eligible for the award of scholarships. Students who after failing or passing the under graduate examination in Arts/Science/Commerce join any recognized professional ortechnical certificate/diploma/degree courses will be awarded scholarships if otherwise eligible. No subsequent failure will be condoned except courses in group-I. Students who pursue their studies through correspondance courses are also eligible. The term correspondance includes distant and continuing education. Employed students whose income combined with the income of their parents/guardians does not exceed the maximim prescribed incomeceiling are made eligible to post-matric scholarships to the extent of reimbursement of all compulsorily payable non-refundable fees. 2. Maintainace allowance Rs.3000/- per month for hosteliers. 5. Reimbursement of expenses for purchase of a computer with accessories. Rs.3000/- as a one-time grant for entire course. 6. Reimbursement of expenses for puchase of aids and assistive devices including necessary sofware related to the particular disability of the selected candidates. Rs.30000/- as a one-time grant for entire course. Click here before applying online. Click on “New User? Register”. Scroll down to click on “Continue”. Fill the details to register. An application id and password will be generated on the computer screen and an OTP will be sent to the registered mobile number. Enter OTP number and confirm. Now, start filling the form. Income certificate of parents/guardians issued by the competent authority in the state government. Self-declaration of community certificate by the parents/legal guardian. Self-attested certificate of previous Qualifying Exam/Board mark sheet. Fee receipt of current course year. Next articleFinancial Assistance for Education of the Wards of Beedi/Cine/IOMC/LSDM Workers – Post-Matric- Application Form Released -Apply! !